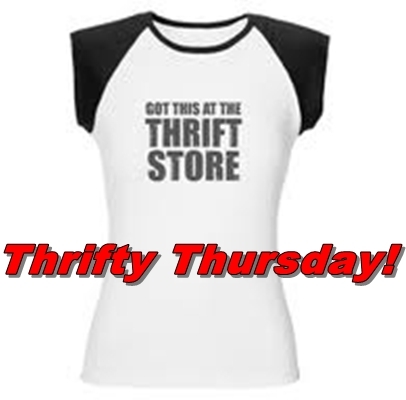 Thrifty Thursday: Village Discount, Unique & Junior League! I*N*S*I*G*H*T (per the tag) = $2.50 at half off Monday at Unique. This cute little light weight blazer, although a size 8, will be perfect for summer with my white jeans or a nice skirt. 100% Silk Casual Corner Blouse = $1.50 at half off Monday at Unique. Given my love for stripes, I couldn't pass on this sweet little number. This can be dressed up with nice slacks and a blazer/added under a suit or dressed down with jeans, a denim jacket and some cute black leather moto boots/brown leather engineer boots. (Can't make out the name on the tag) Dress = $3.00 at half off Monday at Unique. 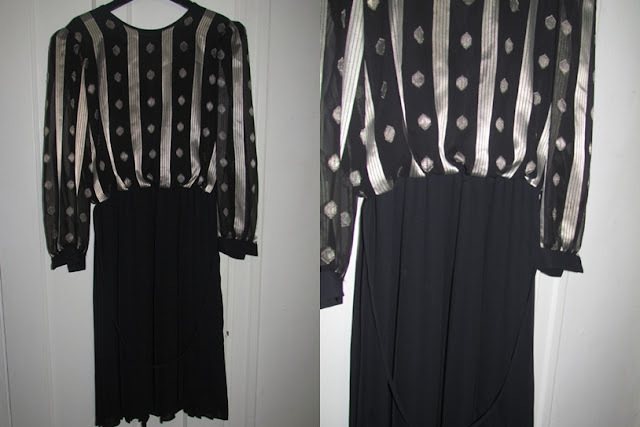 Though I can't place the decade, there was no way I was leaving Unique without this vintage and COMPLETELY sheer gorgeous dress. It's so feminine (and a little tight) and delicate and just awesome! I'll mos def have to wear some kind of slip or something because like I said, it's completely sheer from the rooter to the tooter. Ilie Wacs Blazer = $2.50 at half off Monday at Unique. This can't be anything but vintage 80's awesomeness! As soon as I laid eyes on this blazer it was on and poppington! Though the sleeves are a bit short for me, I am still going to rock this like no one's business...yes indeed. Oh, and this blazer and the dress are made with good ol home grown labor. 100% Silk Joseph A Cardigan = $2.00 at half off Monday at Unique. This cute chunky cardi was one of those right on time finds. My closet/rack are in dire need of warm threads for the sub-zero Chicago temps ahead, and this 100% silk (yep!) is sure to keep me nice and toasty. Amber Sun Collection Knit Sweater = $3.00 at half off Monday at Unique. Purple + Chunky Knit = Win...right? Yeah it does until you wash it and it gets lint on EVERYTHING! That's my fault though for not explicitly following the care instructions on the tag. Otherwise, I love this sweater. It mostly comes to my wrist and is nice and snuggly. Oh, and I LOVE purple. Steve & Barry's Faux Sherpa and Denim Jacket = $3.50 at half off Monday at Unique. Absolutely none of my fellow thrifters liked this jacket, but I did not and do not care, I love it! Denim and faux sherpa...what's not to love? Actually, I didn't love the way it smelled after I washed it. This thing smelled worse after I washed it than it did before and it also made everything else I washed it with smell awful too. I rewashed everything with double the detergent and a good measure of baking soda and peroxide and that did the trick. After weeks of hunting I finally found the perfect black blazer! This beauty made my day, I may have shed a tear when I found it, lol. Bonus? It's machine washable, BAM! (No Tag) B/W Marled Sweater = $2.50 at Junior League Thrift Store. I have a love/hate relationship with this sweater. I love the fit, color and warmth of this sweater but I hate that it's itchy, hairy and it sheds on EVERYTHING! It's like a dog, lol. Very similar to the Joseph A cardi in terms of color, but that's where the similarities end. With a long sleeved undershirt, this promises to be a winter staple for me. British Crown Colony 100% Silk Blouse = $5.00 at Junior League Thrift Store. Oh.Em.Gee. I cannot tell you how much I LOVE this vintage blouse! 100% sheer ivory silk, fits like a dream, slit tail back, hi/low cut hem...LOVES IT! The label on this blouse intrigued me, so I did a little research (Googled it) and found these interesting tidbits. Magenta Foxcroft Blouse = $3.25 at Junior League Thrift Store. My homegirl Naimah actually brought this hot magenta number to my attention. I wasn't going to get it at first, but in the end I did...and I'm glad I did. I love the color and think it will look amazing with my navy blue blazer. It fits well and it's wrinkle free...always a bonus. French Blue Eddie Bauer Blouse = $3.50 Junior League Thrift Store. Last but not least, a French Blue Eddie Bauer blouse. This is another of my fave colors and a wardrobe essential IMO. This blouse can also be dressed up or down same as the striped and magenta blouses. Whew, that does it for this week's edition of Thrifty Thursday. I did pretty well once again and am, for the most part, very pleased with my finds. Have you gone thrifting lately? Find anything good? Let a sistah know! Those of you who live in Chicago know how rare sunny days are in Autumn/Winter, even more rare are mild weather days. It just so happens that for this "photo shoot" in the Sculpture Park, I got very lucky! Many thanks to my BFF and the greatest love of my life (besides my children and Alexander Wang) for shooting these awesome photos. This recycled blazer and scarf may look familiar because I love them and wore them together here, lol. Notice the mixed patterns and colors? Yeeeeah, I'm experimenting y'all, lol! Gold earrings were a gift from my Grandmother. Full length of the entire outfit. Me next to one of my fave sculptures in the entire park. Another of my fave sculptures. 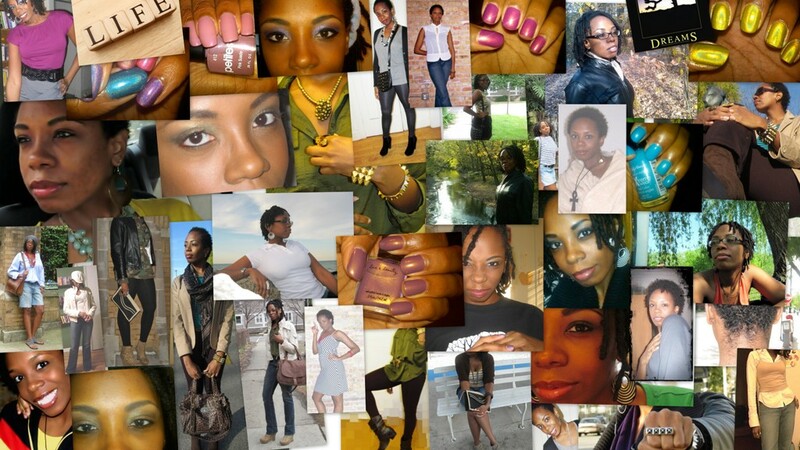 My skin was all kinds of yuck in these pictures. It's clearing up little by little though. I'll blog about my skin care regimen sometime in the near future. Don't the booties look 3D, lol? Want a closer look? Blazerless and enjoying the weather and scenery. Though I'm sure you've seen enough of my pictures, here are some bonus shots! Well not him exactly, lol. Those are his custom Nikes that he designed and received shortly before the shoot. He's so in love with those shoes it's kind of ridiculous, lol. He even has his name on the back of them (you can just barely see it). Okey dokey, that's enough. Do you like the outfit I put together? Dislike it? Let a sistah know! What's Your Opinion on MyGlam? 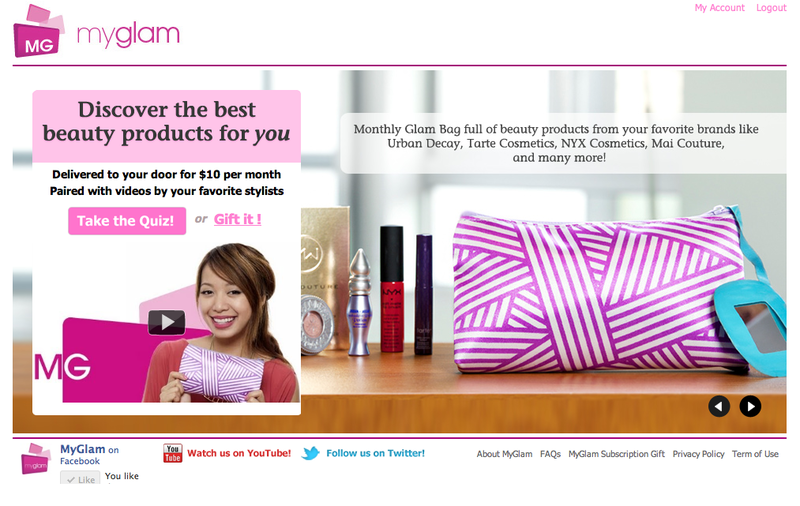 YouTube Beauty Guru Michelle Phan's new pet project MyGlam is causing quite a beauty stir. You'll choose the 8 products you want to receive and pay $49.99. Each month, you get 4-6 beauty products ranging from samples, deluxe samples, to full sized. You can review the items you receive to earn points and then redeem the points for $ off the full sized products. Eco-Emi sends out environmentally friendly products, including cosmetics, health, food, and household items. Health and beauty samples with two different membership types. Hand, nail and foot care subscription. There have been rumors of this company shipping out discontinued or expired makeup. As there are so many other reliable services available, I do not recommend you try them. Michelle Phan's service in which every month, you receive a Glam Bag with 4 to 5 full-sized products or deluxe-sized samples. This is very expensive, but the products you get are also more expensive than the others. Delivers 4-5 deluxe beauty samples monthly. Delivers 4-5 deluxe beauty samples every month. Every month you get one or more full sized product plus samples. You get 5-6 deluxe beauty products every month. You get 5 deluxe beauty products every month. Every month GlossyBox delivers a mix of 5 product miniatures packed in a beautiful box. Get monthly boxes for a higher fee or just a sample here and there for cheaper. Monthly Lust Pack with 5 to 6 premium size samples plus a reward program similar to Birchbox. To Whom It May Concern: I ticked the wrong box for the age question on the sign up quiz, will this affect my subscription at all or is the question strictly for demographic purposes? Also, I'm slightly concerned that none of the gurus on the beauty team are black women. I'm a dark skinned black woman and would really appreciate having a guru that I can more closely identify with. I admire and really like the current panel of gurus, but their tutorials/product choices aren't always appropriate for dark skin. I hope those of us with darker skin tones and coarse hair will be taken into consideration when the Glam Bag products are chosen. Thank you for your time and anticipated sensitivity to my concerns, I'm looking forward to my first Glam Bag. The quiz answers don't affect what products you will get in your Glam Bag, so no worries. As far as the gurus, Andrea is actually black, but I do understand where you are coming from as her choices are not always suitable for darker skin. I am black, and a few shades darker than Andrea so even some of the stuff she wears is too light for me. My suggestion is that when you find a look you like, when you go to purchase this, you can take the name of the color the guru used and ask someone who works for the store or brand to assist you in finding that same type of look in your own suitable shade. If you do not like the products, you can cancel at any time for sure. As I stated before, the products sent are not based on skin color, ethnicity, or even personal preference. The point is to allow people to try new things. If the products are not satisfactory for you, just log into your account and cancel, but maybe just try and give it a try for 2 months before you make a final decision. End transmission. Now, is it just me or was her last response a little snarky? I don't know much about running a business and marketing, but I do know that customer service/satisfaction is key. If you don't do your best to satisfy the concerns of your customers and provide them with good products and experiences, you can kiss your reputation goodbye. I wasn't pleased with the response I received to say the least. So even though I haven't received my first "Glam Bag" (I've certainly been charged though) I'm considering canceling. I would love to take part in one of these monthly beauty sample clubs, but I need to know that the products I receive will reflect me...or at least be something I can use. What do you think? Am I being overly sensitive about the e-mail response? Should I stick with the subscription for a month or two and see if I can use/like what I receive? What would you do? Let a sistah know please!